Galley Wench Tales: Oz: "What's That Sound?" Brisbane, Australia... surprising source of "native drumbeat." 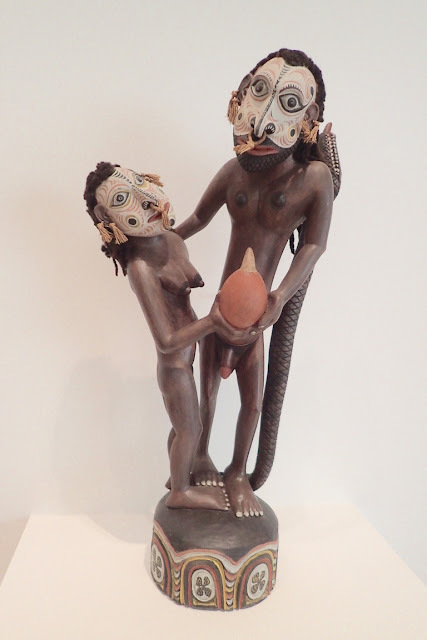 Adam and Eve, Queensland Art Gallery, Papua New Guinea exhibit. Waiting for me in the entry area of Brisbane's Queensland Art Gallery, Wayne wore a bemused smile. "I was sitting there, wondering about the native drum beat, where it was coming from," he explained. "Then I realized -- it was the escalator!" 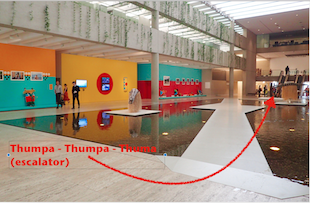 There was a steady thumpa-thumpa-thumpa reminiscent of that could well have tied into the exhibit downstairs on Papua New Guinea, or even the Aboriginal art nearby on the main level. Then again, Brisbane's metro population is 2.3 million, urban area 3.4 million, about on par with our hometown Portland Oregon's metropolitan statistical area, which places it 23rd in the United States. 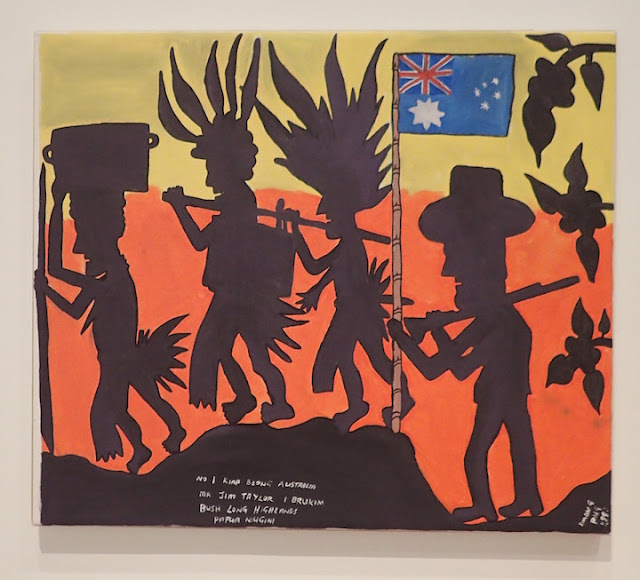 Modern art portion of Queensland Art Gallery's Papua New Guinea's exhibit. 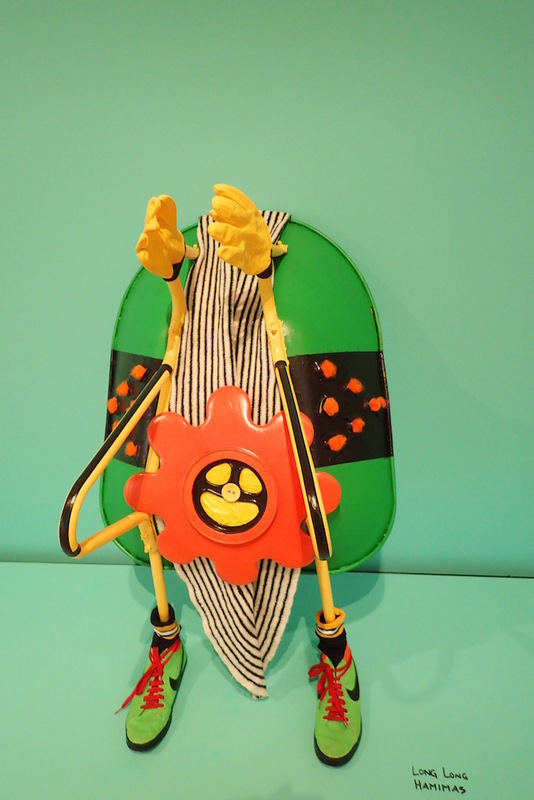 One of a series of whimsical wheelbarrows. Brisbane, Australia. We've spent a goodly part of the last two years in second and third-world countries. Even in New Zealand, we didn't hang out in Auckland, New Zealand's largest city, and only spent an afternoon in Wellington, Kiwi-land's other modern metro. We enjoyed Brisbane's Queensland Art Galley. Free entry, and it provided an eclectic mix.... Aboriginal art, European masterpieces you could walk up to and nearly touch, a special Papua New Guinea exhibit ranging from native to modern elements and even a Chinese artist's whimsical transformation of everyday items -- like sneakers -- into classic Dutch-style ceramics. And, on a hot sunny day of walking, it was air conditioned. An Australian visits Papua New Guinea. Queensland Art Galley, Brisbane Australia. on the floor. 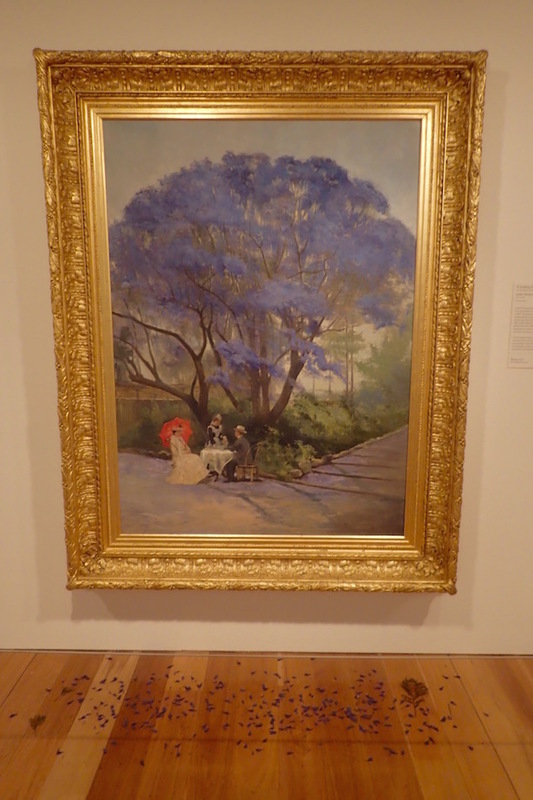 The jacaranda were blooming at the time in Brisbane, Australia. This is a recent retrospective of our time, November 30 - December 2, 2016 in Brisbane (aka "Bris-Vegas"), Queensland Australia (S27.27.233E153.11.427), at the Manly Bay Trailer Boat Club (MBTBC). Location, Queensland Art Gallery, Brisbane, Australia. We're currently in Pittwater, New South Wales, Australia (S33.39.433 E151.18.051), about an hour's drive (in light traffic) and four hour's sail (in good conditions) from Sydney. Here, we're most likely to hear the laugh of the kookaburra, or the oddly amusing screech of the sulpher-crested cockatoo. Working on catch-up posts (including more posts about Brisbane), searching for a camper van for our next nomadic home, and getting s/v Journey ready to sell. Even now, much as we appreciate access to modern conveniences again, we are longing to return to spaces where most of what we need most of the time is in easy walking distance. We plan to seek out those experiences on our road trip.